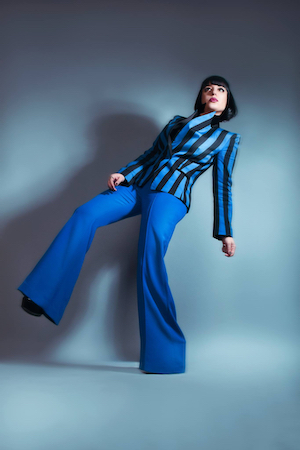 Suave in her suit, Carla Lippis is the epitome of cabaret cool with her shiny bob, heavily lined lids and cigar placed nonchalantly between crimson lips. And with a vocal style that adds more than a dash of rock n’ roll to the cabaret lounge, she’s come a long way from her days at the Johnny Young Talent School. Lippis will be making her first ever appearance in Perth, as part of La Soirée 2019, the Fringe World favourite with a new line-up. Ahead of opening night, Lippis took a moment to answer Seesaw’s Q&A. Carla Lippis. Photo: Ayesha Hussein. Carla Lippis: I came out of the womb head banging, apparently. CL: When I was very little, my parents thought it was a good idea to send me to that fabulously kitsch performance institution called the Johnny Young Talent School (folk under 30 will have to Google it – he also had a wildly popular TV show with an all-singing, all-dancing troupe of teen and pre-teens doing cover versions of the hits of the time). While the other little girls basked in the glow of their glitter gel, reflective spandex leotards and dazzling scrunchies, I was the frowning child with the short black bob in dark coloured clothes in the corner. I found their over-enthusiasm disturbing. Probably the most formal training I have undergone thus far. I joined my first band when I was 15, it was the coolest thing a girl who went to a strict Catholic school run by nuns could do. While my attempt at teenage rebellion was a touch short of sensational, we did lie about our age so we could get gigs in 18+ venues. We thought we were badass. It all went from there, until eventually I found myself living in Italy and then London singing my head off. CL: My artistic practice usually involves a bottle of white wine, a pen and a wall to write on. CL: Playing with KISS and Motley Crew to 20,000 people. It was nuts. The drum kit was on a roller coaster. CL: Once I guested on vocals at a rave and I was so into the track I fell off the stage. It hurt. It was also hilarious. CL: Asking for extravagant riders like 10,000 green M&M’s, two boa constrictors and a semi-automatic weapon (you know, just to get me in the mood). While that statement is completely false, I can verify that the aforementioned items were on a particular rockstar’s rider. I’m just not going to tell you which one. S: Are you new to Fringe World? CL: This is my first time performing in Perth and my first Fringe World Festival. It has barely started and I can feel the excitement of the folk on the street. CL: The flying fox! It was the most dangerous piece of equipment, so naturally the most fun. Catch Carla Lippis in “La Soirée 2019”, January 17 – March 3, at The Ice Cream Factory. Pictured top: Carla Lippis. Photo: Veronika Marx.